LLLT is an acronym for Low Level Light Therapy. This refers to a therapy that utilizes laser or light energy below a specific energy threshold and within a specific wavelength. Light sources used for LLLT may include laser and LED devices. Laser devices used for LLLT are also referred to as cold lasers. LLLT devices produce no heat, are safe and cannot burn or injure the skin. Multiple clinical studies have shown the effectiveness of Low—Level Light Therapy in promoting hair growth in men and women with androgenetic alopecia. The exact mechanism is not fully understood, but the most recent research has identified that LLLT is absorbed into the cells, triggering enhanced cellular activity. In other words, the theory is that LLLT makes aging cells more active, thereby increasing their effectiveness in hair growth. Are there any medical studies (clinical trials) that support the use of LLLT for hair growth? Yes! Please see our page on clinical studies, here. Do physicians advise the use of LLLT for hair growth? Yes, Medical Doctors, including dermatologists, in the United States, Europe and Asia prescribe the iGrow® for use with male patients suffering from androgenetic alopecia. What is the benefit of a device that combines both Laser and LED light? Red light from Laser and LED devices emitting 650—670nm wavelength light can stimulate cells within the follicle, as part of an effective LLLT hair treatment. The Laser light produces a specific wavelength that is believed to stimulate the hair follicle cells. The LED light uses a broader beam of gentle light energy to cover a wider area of the scalp. Combining the Lasers and LEDs offers the benefit of both light sources for men and women with androgenetic alopecia (thinning hair). But the proof is in the results. 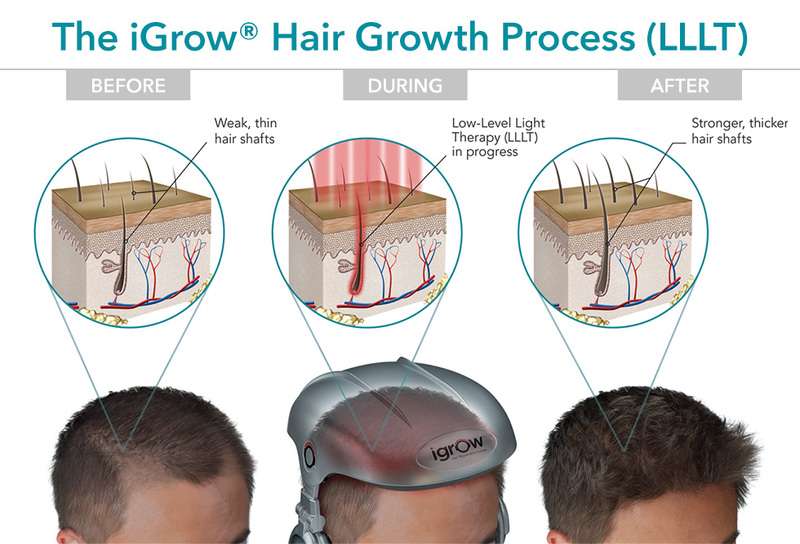 The iGrow Hair Growth System has shown the highest percentage increase in new hair growth of any published clinical studies on light mediated hair growth. How does wavelength affect LLLT for hair loss treatment? It is important to use light within the recommended wavelength for laser hair treatment. Research studies suggest the most effective wavelength for hair growth is between 650—670nm. This wavelength has the most efficient and effective absorption that is essential for hair growth. Do all LLLT devices use laser and LED together? Most LLLT devices use either LEDs or Lasers. The iGrow® by Apira Science, Inc. utilizes both high—quality Laser and LED light sources. This form of LLLT is effective for hair growth in men and women with genetic—based hair thinning/loss. Will all laser and light devices provide equivalent results on the scalp? No. Not all devices have the same power and energy output, and therefore will not yield the same results. Many devices only cover a limited area. Most of these devices require the user to manually move a hand—held comb or brush repeatedly over the scalp for 10—20 minutes at a time. This is tiresome and does not provide consistent application of the light. The iGrow® combines Laser and LED light in a hands—free automated device that is easy to use, while providing consistent scalp coverage in each 20—25 minute treatment session. Will all laser and light devices provide equivalent results on the scalp? No. Not all devices have the same power and energy output, and therefore, will not yield the same results. Many devices only cover a limited area. Most of these devices require the user to manually move a hand-held comb or brush repeatedly over the scalp for 10-20 minutes at a time. This is tiresome and does not provide consistent application of the light. The iGrow® combines laser and LED light in a hands-free automated device that is easy to use, while providing consistent scalp coverage in each 20-25 minute treatment session. Can LLLT be used with treatments such as Rogaine or Propecia? LLLT can be used with hair loss products Rogaine or Propecia. However the use of pharmaceuticals is not required to achieve results with the iGrow®. That's what's great about the iGrow! It is a product that requires only a one—time investment. The iGrow causes no side effects, isn't messy, and is very easy to use. Using an LLLT DeviceIf 3—4x a week has good results, will more frequent sessions yield a better result? There is no evidence that increased Low—Level Light Therapy (LLLT) will provide better results. LLLT should only be used as prescribed. Each LLLT session should be followed by a period of rest. This translates into alternating session days. How long will I need to continue LLLT sessions? Hair loss is a progressive condition. If untreated, you can expect to lose more hair over time. After the initial 4 to 6 month LLLT treatment period, you should continue sessions once or twice per week to maintain your hair quality. I just noticed my hair is beginning to thin — is it too soon to start LLLT sessions? The iGrow® is intended to be used by men and women who are afflicted with androgenetic alopecia. LLLT hair treatment should be incorporated into your weekly preventative maintenance routine to preserve and strengthen existing hair and provide a healthy environment for continued growth. At what age is it safe to start LLLT? LLLT is effective in men and women ages 18 and older. Please consult your physician if you are under the age of 18. Can LLLT be used after transplant surgery? Yes. LLLT can be used immediately after transplant surgery. Doctors have reported that using LLLT can help stimulate healing of the wounds, and improve transplant results in hair loss patients. In fact, hair transplant surgeons worldwide have chosen to use the LLLT to improve results. Anecdotal reports have shown that LLLT sessions immediately following surgery decrease the recovery time in hair transplant patients, and increases hair thickness. Consult with your transplant surgeon for more information. Are all LLLT devices safe to use after transplant surgery? No. After transplant surgery, it is important that your scalp does not come into direct contact with any foreign object. Many devices use teeth or spikes that are studded with a laser. You should not use such devices as they will damage your transplant. Instead, use a device that covers the entire scalp but does not directly touch the scalp. At the present time only the iGrow® by Apira Science is safe and effective for patients immediately following transplant surgery. Questions About iGrowIs iGrow® safe to use at home? The iGrow® has been specially designed with safety features for at—home, office and travel use, including a safety mechanism controlling both laser and LED devices. In addition, the iGrow® is designed so that it can only be turned on when it is firmly placed on your head. The iGrow®is a safe and effective laser hair treatment for use at home or while travelling. Is the iGrow® fully automated? Yes, the iGrow® requires no manual movement. Simply, place the iGrow®on your head, select one of 5 pre— programmed sessions and then sit back and relax. When will I know if iGrow® is working for me? Every person is different. However, within 12 to 16 weeks of using iGrow® as directed, most users report that they can see a positive change. The appearance of thicker, fuller, and healthier—looking hair is typical within 24 weeks, or 6 months of LLLT. Do I need to wash my hair or use a special shampoo before using iGrow®? You can use your normal shampoo to keep your hair and scalp clean. Are there any negative side effects associated with using the iGrow®? No. Testing and user testimonials have shown no side effects when utilizing the iGrow® with LLLT for hair growth. Why should I use iGrow® versus physician in—office lasers? The iGrow is one of the most powerful hair growth systems developed for home use, and has an equivalent output to most in—office hair lasers. Further, the iGrow's patented headphone design maintains a fixed distance of 3cm from the scalp. In addition, the iGrow® can be used conveniently at home, the office, or any convenient location while listening to your favorite music on your iPod® or MP3 player. Why should I use iGrow® versus other hand held devices? The iGrow® is hands free, easy to use and it provides full scalp coverage. Compare that to moving a laser comb every 4 seconds for 20 minutes. The iGrow® has more light energy and provides the most consistent scalp coverage necessary for great results. I am completely bald and want to use iGrow®. Will it work for me? The iGrow® is not recommended for those with severe hair loss. Questions About SafetyIs iGrow® regulated for safety? Yes. The iGrow uses Class 3R Lasers which are recognized as safe by worldwide governing medical bodies. It meets the safety guidelines established by the United States and many foreign governments for safety. The iGrow is manufactured according to ISO 13485, the most stringent standard for medical device products. Does the iGrow® emit any heat or radiation? Only low—energy laser and LED light is used. Clinical studies have shown that Low—Level Light Therapy (LLLT) is safe. LLLT has been used for decades in hair restoration clinics. Be assured that the iGrow's non—invasive laser technology is perfectly safe. Is iGrow® safe to use for a woman? Yes. The iGrow® is an effective treatment for hair loss in most women, or for thinning hair in women. Is iGrow® safe to use for a pregnant or nursing woman? Please contact your medical doctors for guidance. Is it safe to use finasteride (Propecia™) and/or minoxidil (Rogaine™) while using iGrow®? Yes. The iGrow® is safe to use with Rogaine® or Propecia®. There are no contraindications with these medicines.